A statement said the two briefed the prime minister on the "fruitful and productive" 2+2 dialogue held earlier Thursday. 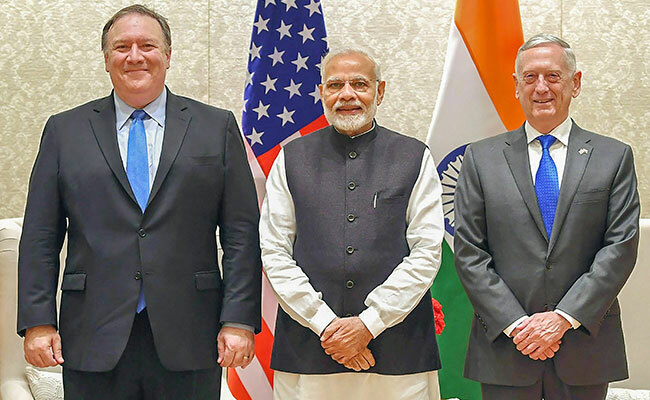 US Secretary of State Michael R Pompeo and Secretary of Defence James Mattis Thursday briefed Prime Minister Narendra Modi on the first 2+2 dialogue held between the two countries. It said the two briefed the prime minister on the "fruitful and productive" 2+2 dialogue held earlier Thursday. The prime minister congratulated both the secretaries and their Indian counterparts External Affairs Minister Sushma Swaraj and Defence Minister Nirmala Sitharaman for holding of the first 2+2 dialogue, the statement said. India and the US Thursday held the first edition of the twice-deferred two-plus-two talks, covering the expanse of bilateral ties and looking to expand their global strategic cooperation, including in the strategic Indo-Pacific region.